A few days ago I started a little cross-stitch project for Christmas, I like to have something small and portable on the go so I can pop it in my bag if I’m going away or somewhere with a lot of waiting! I also tend to keep it in the dining room so whilst I’m cooking tea I can pick it up and do a few stitches, I do have to use the oven timer religiously though, otherwise I’d get carried away with the cross-stitch and tea would be ruined! This is a Humbug I can hang on my Christmas tree, it’s got mistletoe and gold ribbon entwined round it. I really like the apparent simplicity of her designs, she just uses whole cross-stitches but uses the back-stitch to give the shape, the eye follows the outline rather than the blocks of colour, it gives a lovely light effect. The design only uses nine DMC thread colours, it never ceases to amaze me that however extensive your thread collection is, you never have the right colours in! Despite having a box full of threads, I only had two in stock, they’re not even ‘new’ colours!! I went to the Knitting & Stitching show with a list of what I needed. The design is fairly quick and simple to stitch, though I found I did have to concentrate, it was frustrating how many times I had to undo stitches in the first hour! 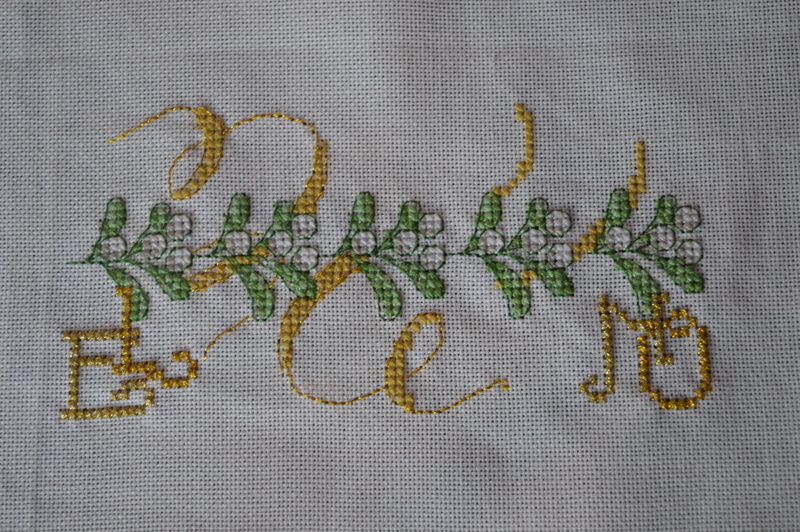 I’ve just got to finish the ribbon and a line of backstitch around the design, then I can make it up. 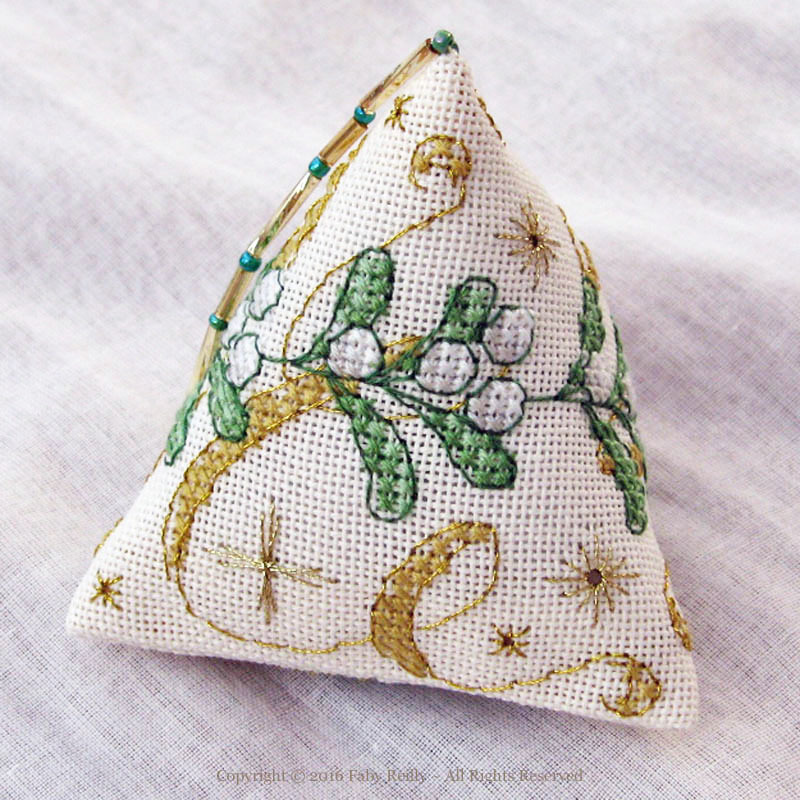 The backstitch is used with a whip-stitch to sew the seams of the humbug. There are instructions to either stuff it as an ornament, or line it to make a mini present box, I think I’ll just be stuffing it. Hopefully I’ll finish it this week. I’m linking up with Kathy’s Quilts for Slow-Stitching Sunday, why not have a look what everyone else is stitching. This entry was posted in Christmas, embroidery, Serendipity and tagged Christmas, cross-stitch, Faby Reilly Designs, Mistletoe Humbug. Bookmark the permalink. Really like this and I know just what you mean about never having the right threads! This is so beautiful!! No doubt not having the right threads has something to do with “Murphy’s Law”; since I have to mail order my threads I’ve become a good substituter, lol. All my threads are older…I have them wound on the same cardboard shapes that you have. I love that little ornament you are making…so nice to have a little project to work on while the tea is being made! It’s so pretty and will be a lovely gift! Thanks for sharing with the Slow Sunday Stitchers! It’s looking brilliant !! So pleased you’re enjoying this design 🙂 !! What a lovely project. I’m going to check out fabys designs!